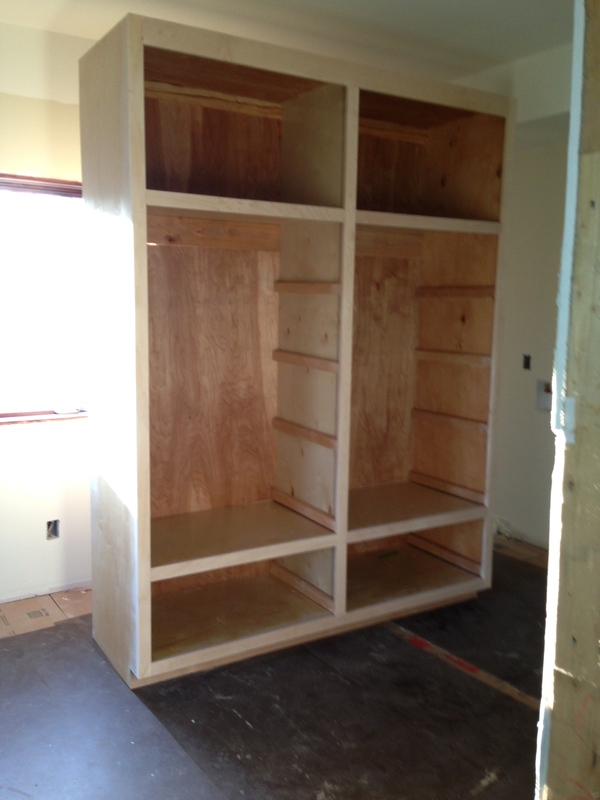 Cabinets Made, Trim Finished, and Floors Installed! First for the GREAT news . 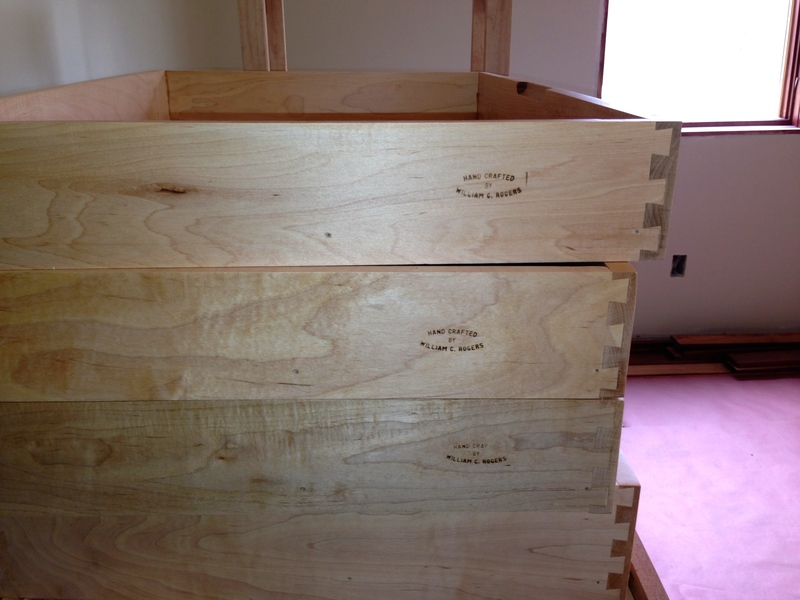 . . Bill finished making and assembling the cabinets!!! What a long and stressful process. He officially finished them on Sunday, March 30th. 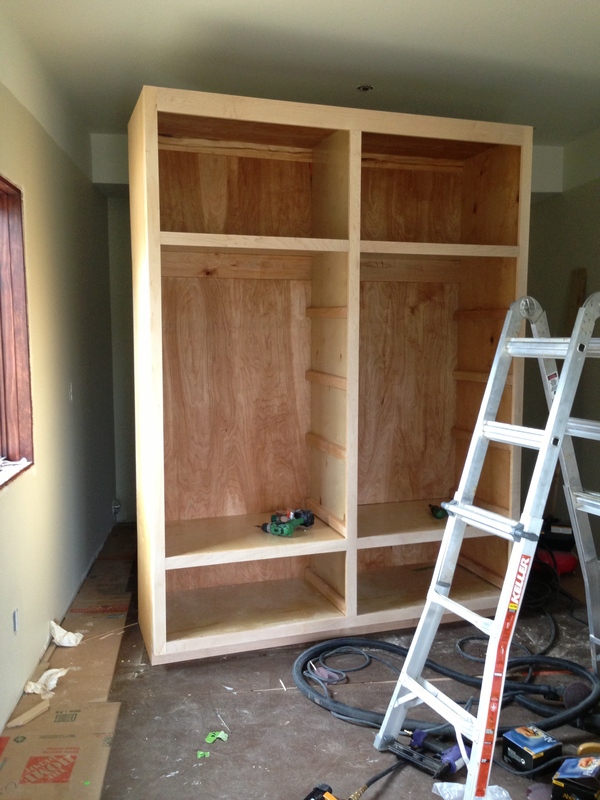 He started building the big pantry cabinet in the laundry room. 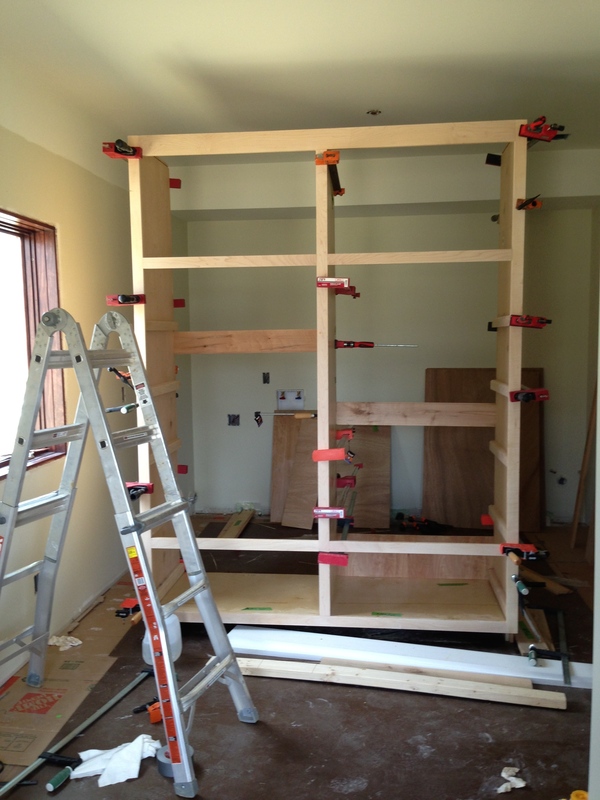 With Zach’s help on March 25, Bill glued the pieces together and they used all the big clamps Bill had. Zach said he never dreamed they would use that many. The big pantry cabinet all clamped up. 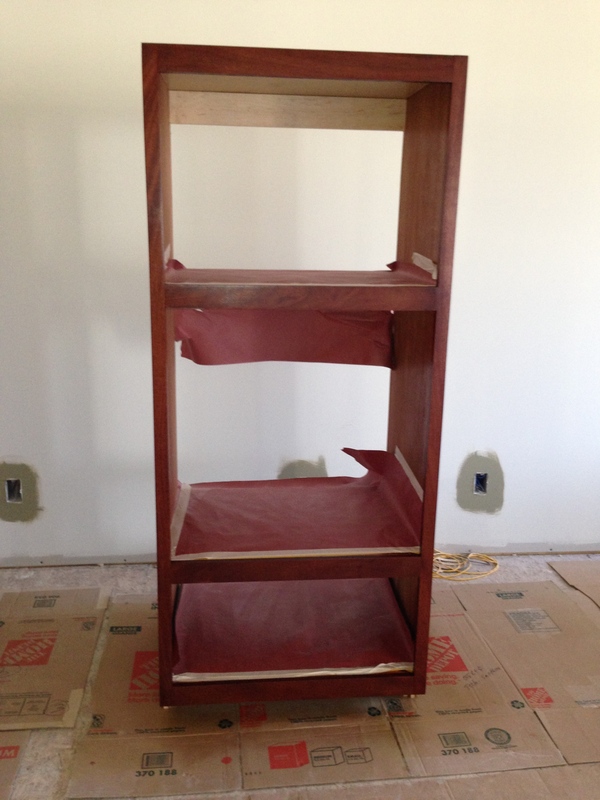 Bill moved to putting the wall corner cabinet together later that week. 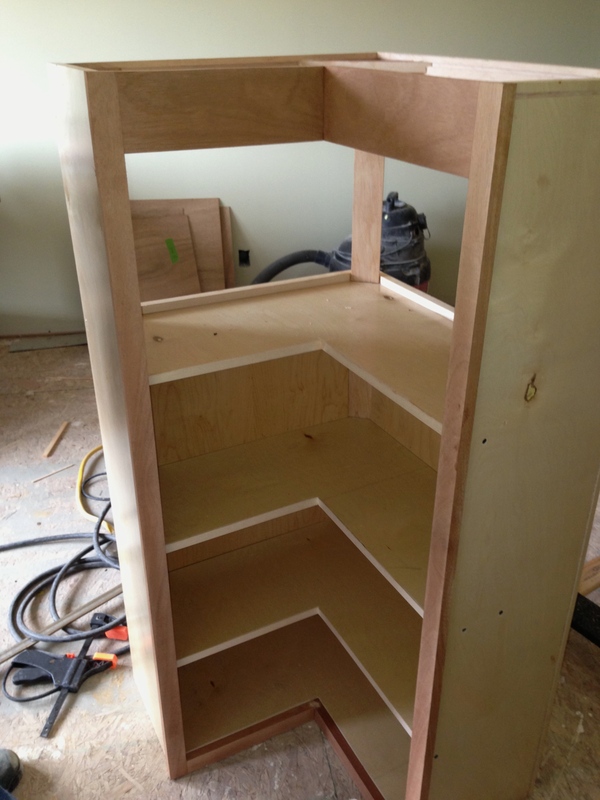 This cabinet has been a lot of work figuring out all the shelves and backs. He finished it on March 28. 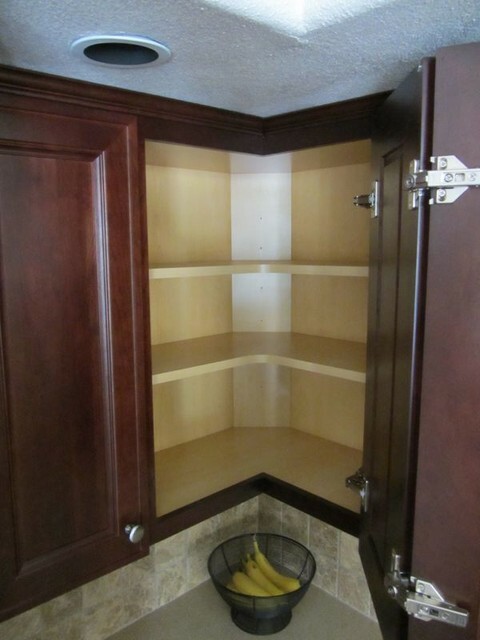 This is very tall upper cabinet. I think it’s 48 inches. Here is the inspiration photo which spawned the idea for the corner cabinet. 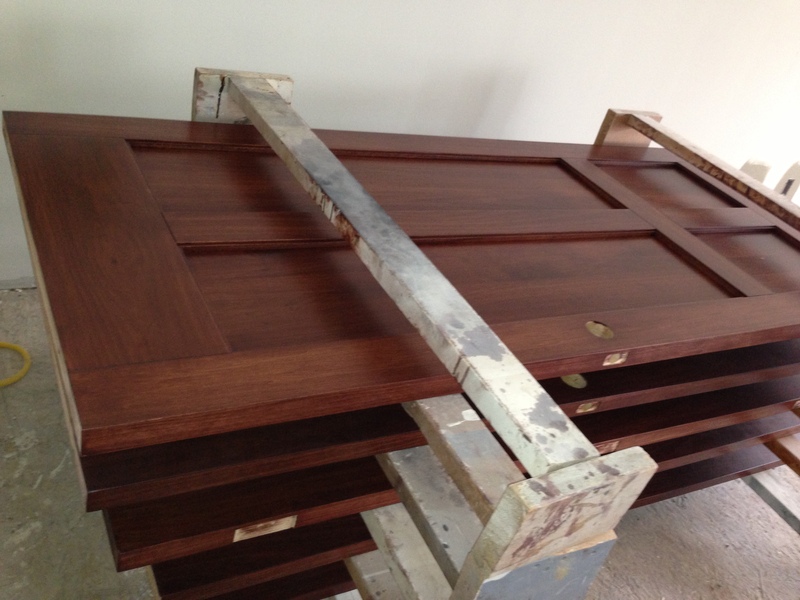 The doors for our cabinet will be hinged together like the inspiration cabinet. I spend way too much time on houzz.com! After this cabinet was done, Bill sanded all the cabinet drawers and stamped them prior to the painters applying a poly finish. 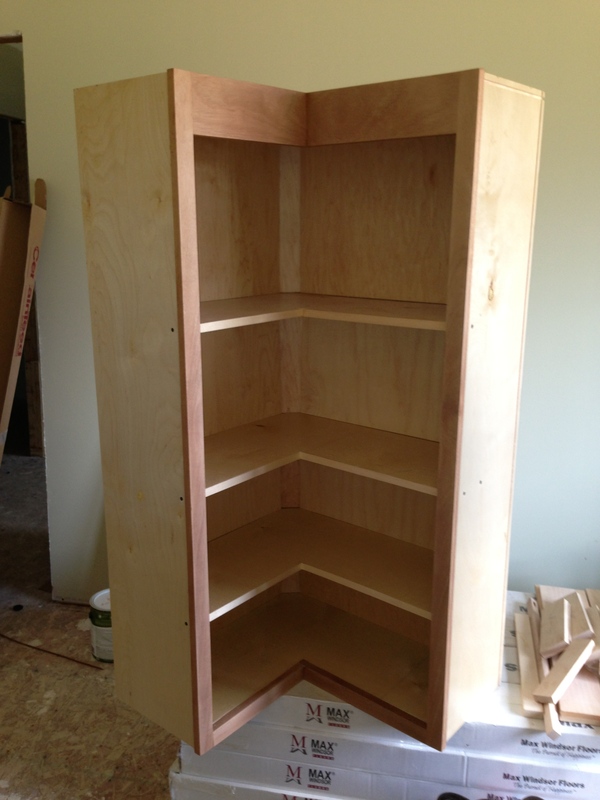 Then Bill finished the last cabinet – the big pantry. All done with toe kick! 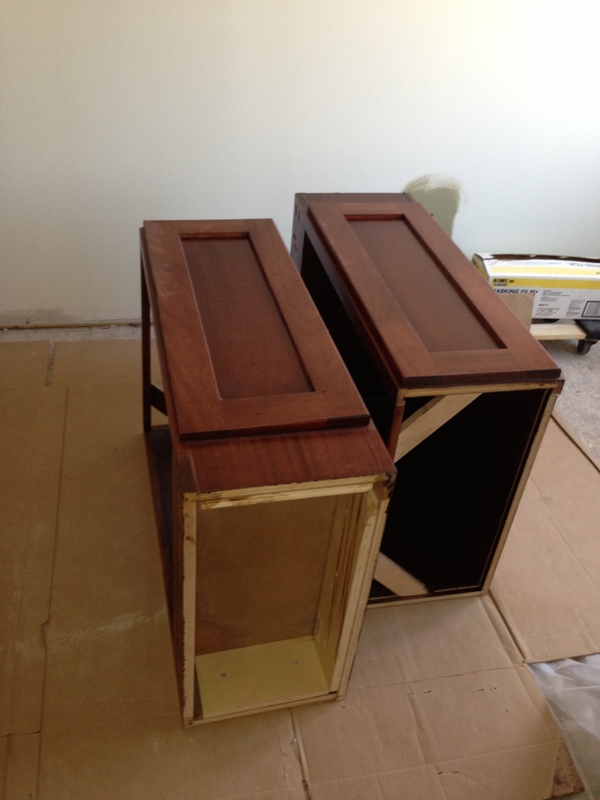 Now it was up to the painters to get busy staining and painting cabinets. We thought they would show up on Monday, March 24. But they didn’t. 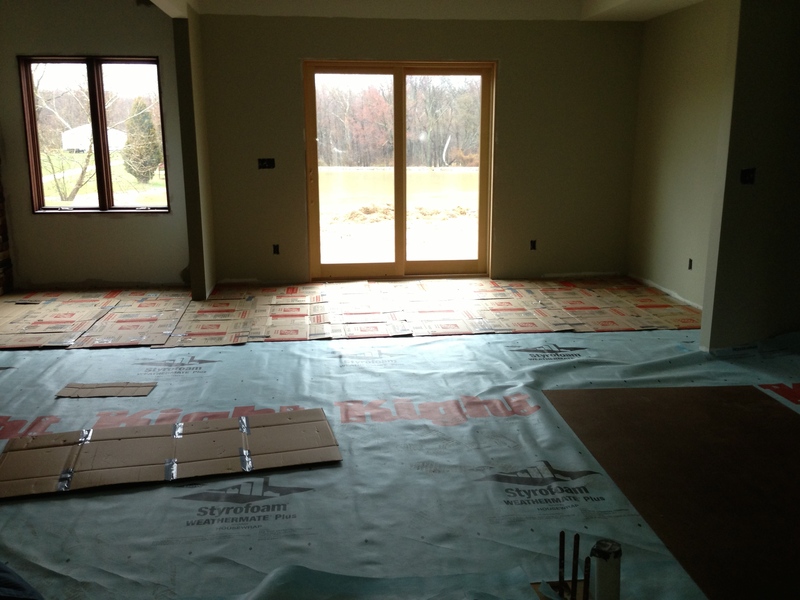 Bill had scheduled the hardwood floors to be installed the following Monday – March 31. 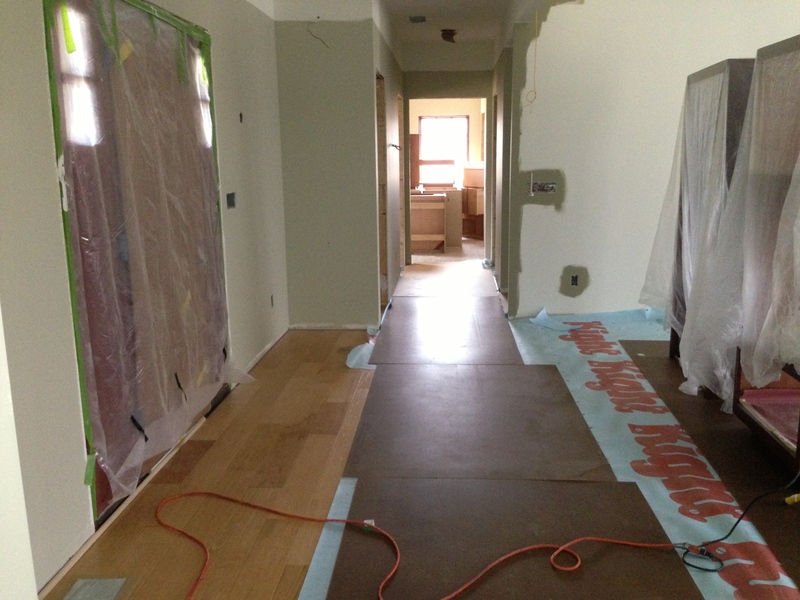 The painters had to get done in the house so the floors could be laid. 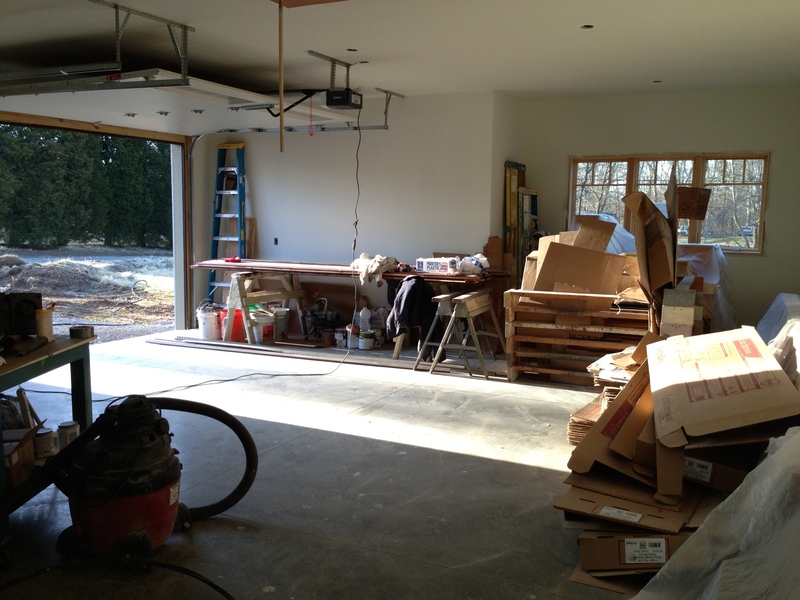 The big spraying tent had to be removed in the dining/kitchen area, too. But the painters needed to do more spraying before it came down. Bill called Mark the painter Monday afternoon to tell him he had to be done in the house by Friday. He said they would be there the next day. But, Tuesday came and went and no painters. Grrrrr! Mark and Shayna finally came on Wednesday, Thursday, and Friday, March 26-28, and worked long days. 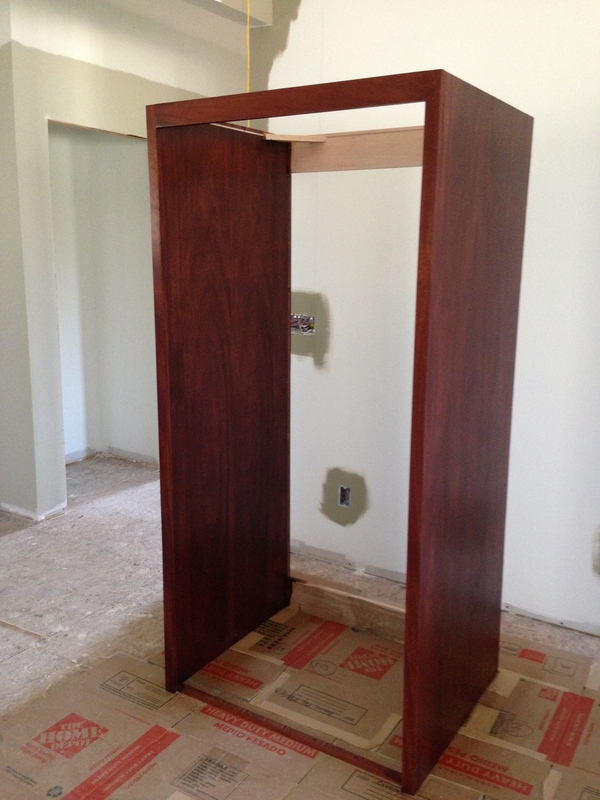 Interior doors all done. The finish is so soft and smooth. 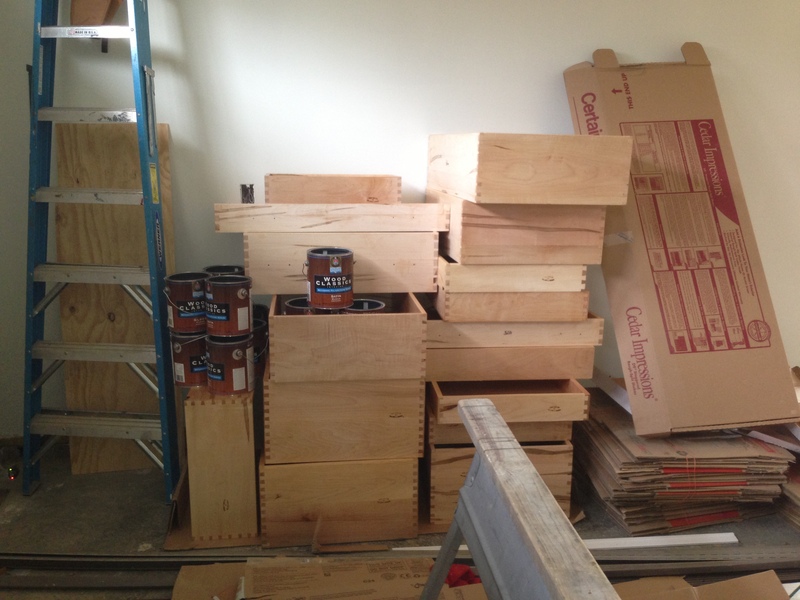 By late Friday, Mark and Shayna got all the spraying done and everything stacked and put in the bedrooms or garage. 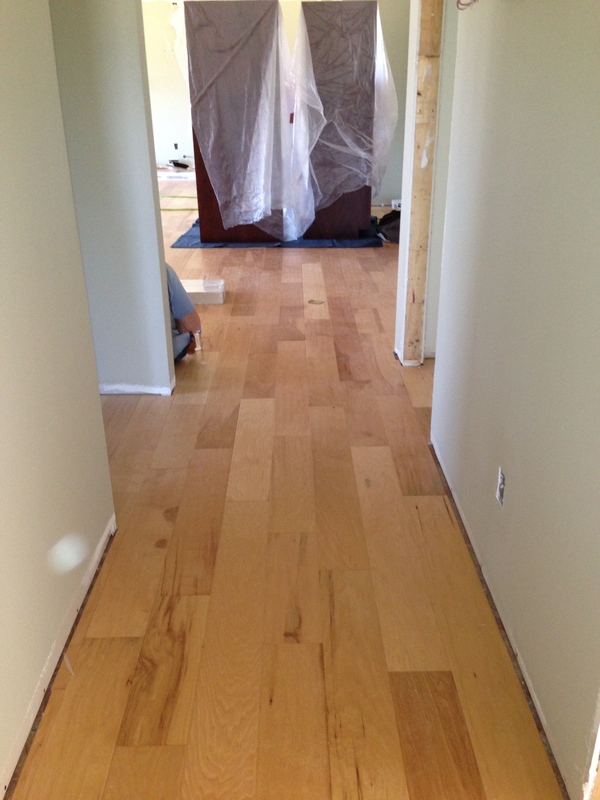 Unfortunately, the one thing I wanted done before the hardwood floors were installed – painting the family room – did not get done. Boo! Bill and I worked down at the house last weekend reorganizing the garage, taking down the spray booth, and sweeping and vacuuming the floors. We stacked all the drawers in the bump-out area of the garage, putting Styrofoam between to protect them. We moved the dishwasher and trash compactor into the utilities area. Bill moved the extra tile boxes in that area, too. Those things were so heavy I couldn’t budge them. I don’t know how Bill picked them up. Then we moved the painter’s saw horses and all his empty cans of stain and paint and buckets and everything else that belonged to him all to one side of the garage. We moved all the laundry cabinets in one area of the garage along with all the laundry cabinet doors. This way Mark and Shayna could work out of the garage – except for the big pantry cabinet, which he said they would paint in the laundry room. After we had the garage organized we moved into the house. We picked up all the cardboard that the painters used and either trashed or saved it depending on the condition. Then I started sweeping. This is my least favorite thing to do since it kills my back. I popped some Extra Strength Tylenol and swept. Bill followed behind and vacuumed. Bill spent many more hours vacuuming than I did sweeping. 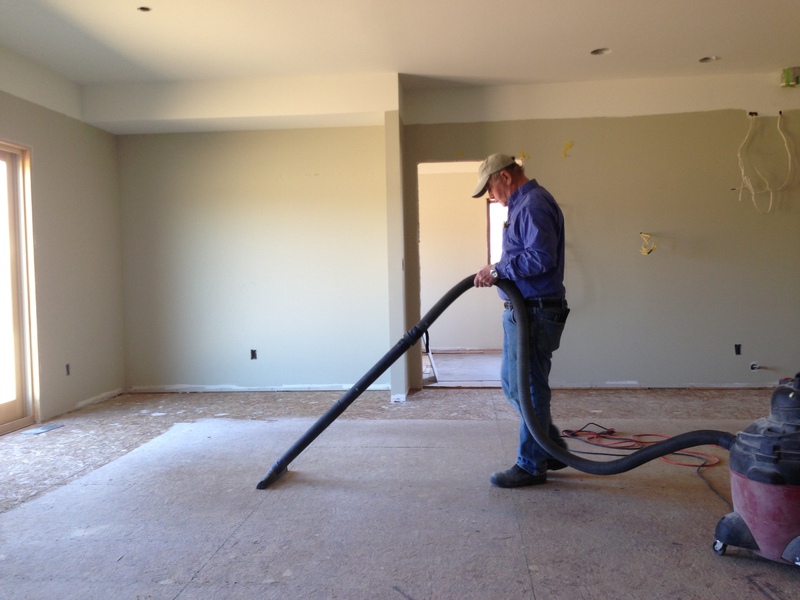 This was the same scene as when we cleaned up after drywall – just not has much dust. See the area where Bill is standing. That is poly residue. Bill says our floor is now sealed! Seeing how much poly saturated the sub floor was reassurance that the spray booth was a good thing. I can’t imagine what our walls and windows and doors would have looked like if they had not used the booth! 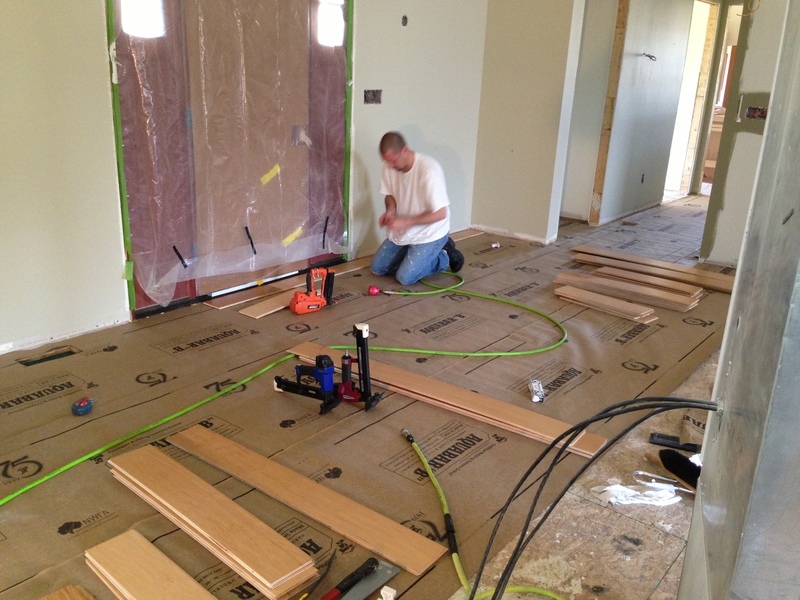 Mark suggested that we leave the two large kitchen cabinets in the family room and ask the hardwood floor installers if they could move them from one area to another after they installed a section. 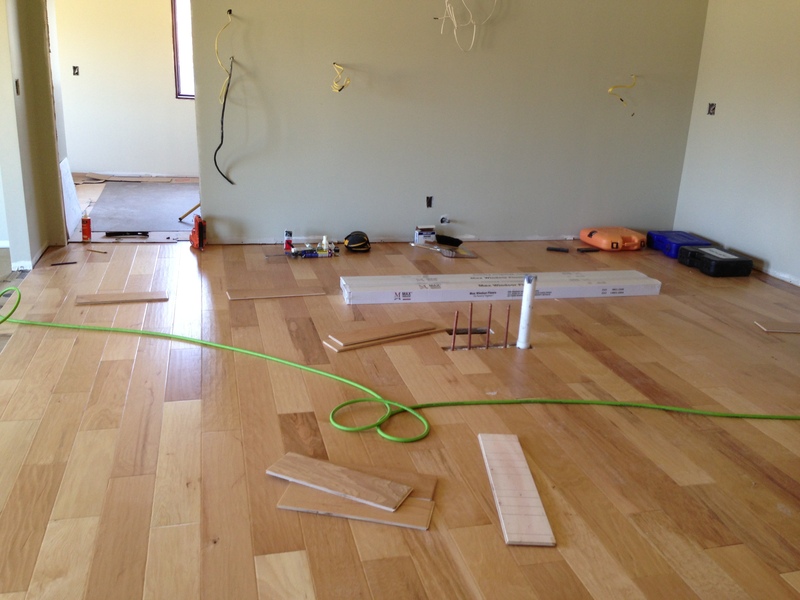 Bright and early Monday, March 31, the hardwood floor installers came and set up shop with their saw in the garage. Hmmmm. I guess Mark and Shayna wouldn’t be able to work on cabinets in there with all that sawdust. 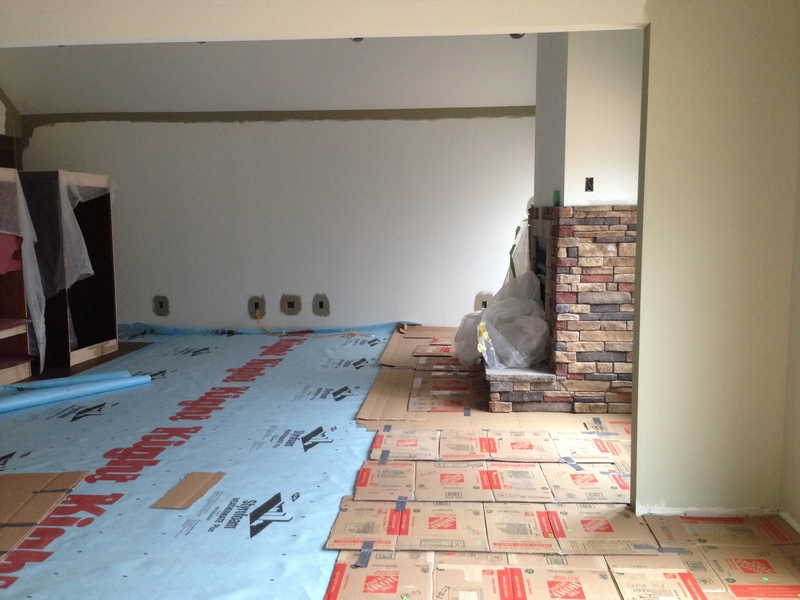 One of the guys finished installing the tile in the laundry room (they had run out of tile several weeks ago). I didn’t take a picture of the finished floor. Mark and Shayna arrived and since it was a warm sunny day Mark told Bill he thought he’d spray the painted cabinets outdoors. It was a warm sunny day but it was also windy! Bill told Mark that he didn’t think it would be a good idea in case the paint would get all over the cars and our house and pole barn. So, instead Mark and Shayna worked Monday and Tuesday caulking the exterior of the house. 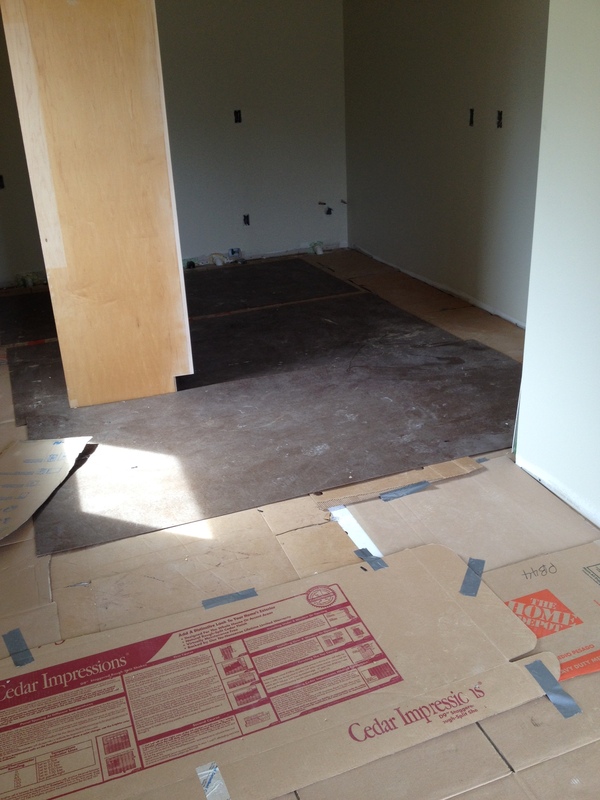 In the meantime, the floors were going in nicely. 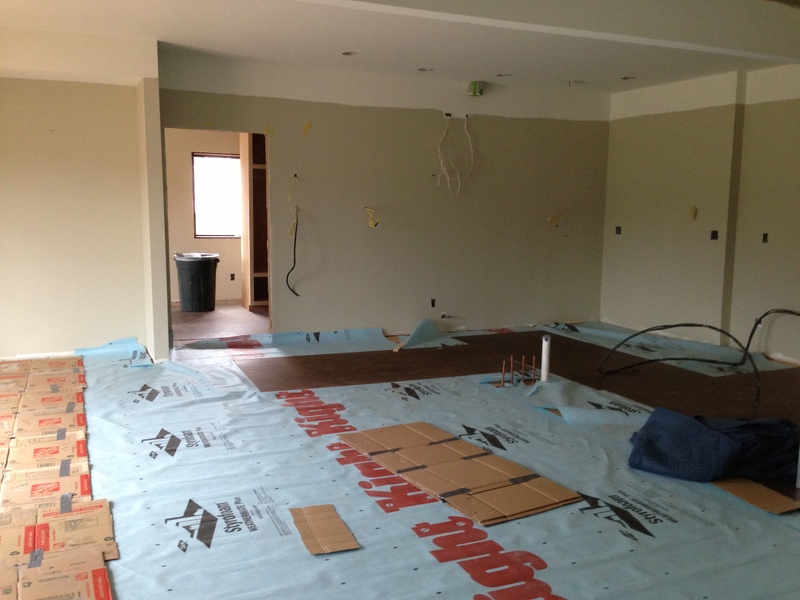 By noon on Tuesday, April 1, the installers had a good part done and said they would be finished Wednesday morning. Tuesday Mark told Bill that since it was going to rain the next two days, they would be back on Friday. 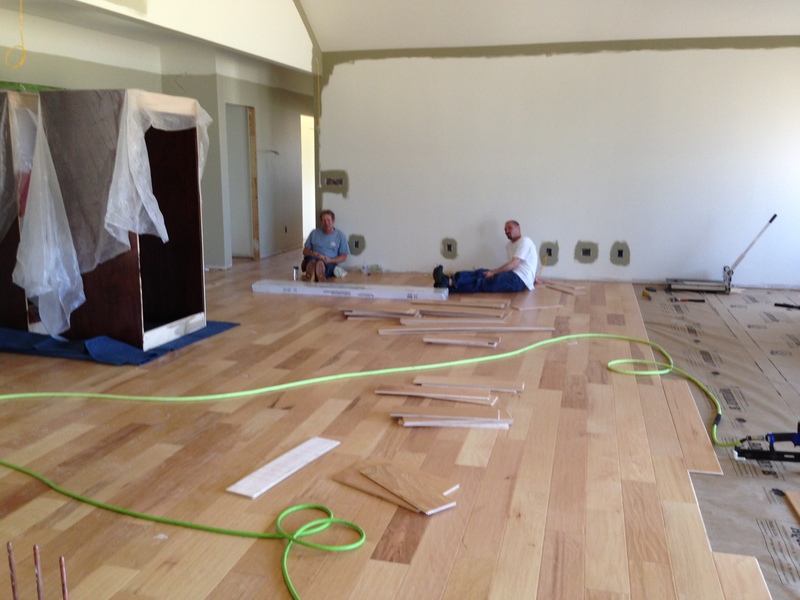 Meanwhile the floor guys came Wednesday and finished up. 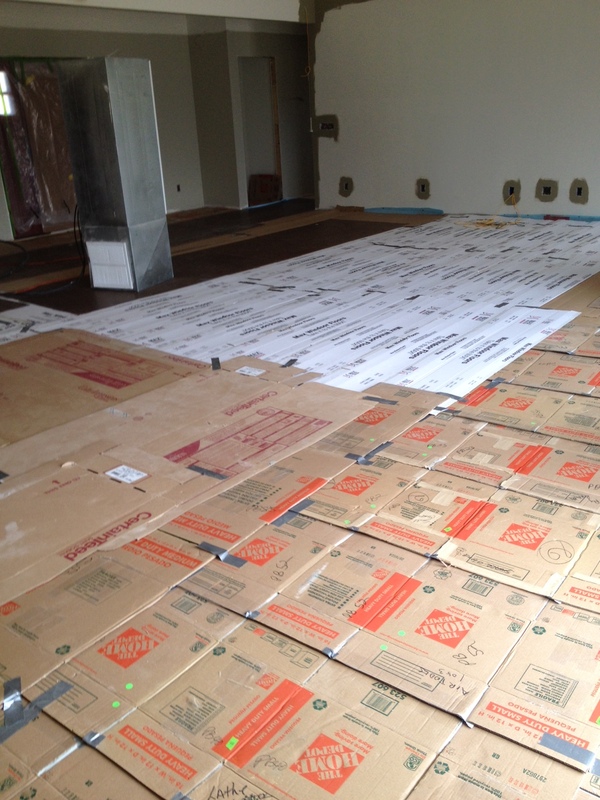 Wednesday afternoon, Bill started covering the floors with leftover housewrap and cardboard. 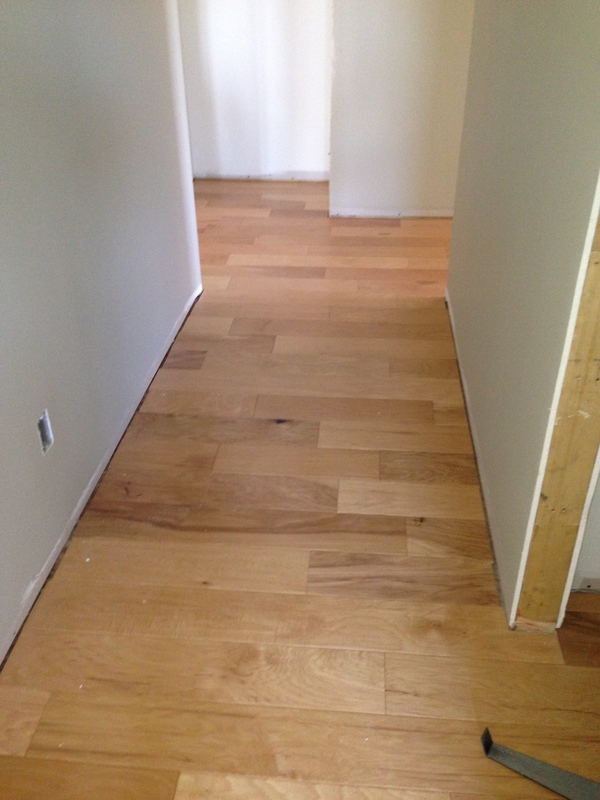 He used hardboard panels in areas of high traffic. 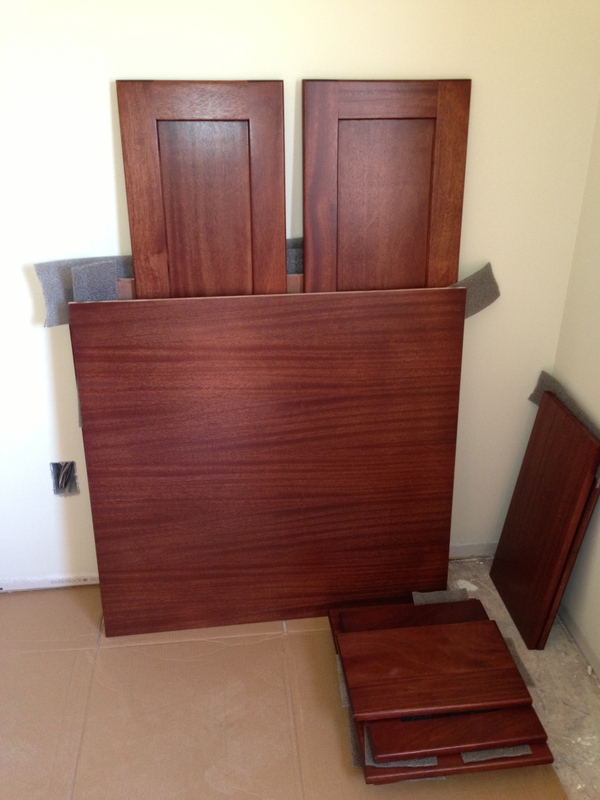 A friend of mine had used the hardboard panels when he was renovating his kitchen. He suggested they worked well when trying to move in appliances without scratching up the floors. Thanks, Keith, for the idea. Bill and I worked on covering the floors all day Thursday. Those moving boxes sure came in handy! Used every box we had! Bill swept the sawdust out of the garage and text Mark that we were ready for them to paint the family room and paint and stain the rest of the cabinets. Mark said they’d be here the next day (Friday). Bill got a call earlier in the week from our electrician and he said he would be out one day to install our meter. Bill was going out-of-town on Friday so he asked me to check on the contractors the next day. 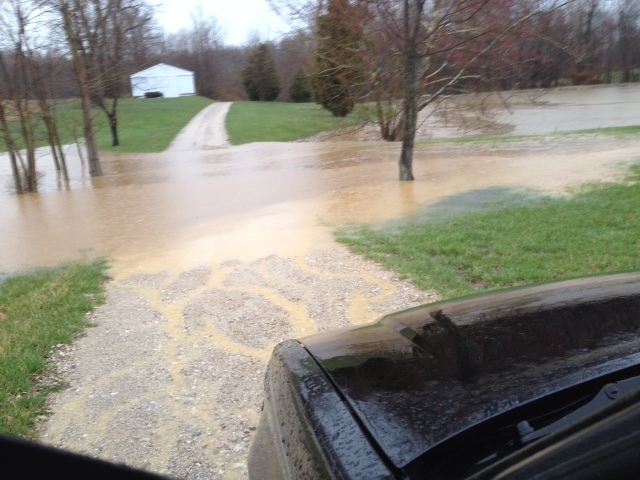 We had storms all day Thursday and by 5:00 pm, this is what Jill and Jim’s driveway looked like. This is going toward Jill and Jim’s house. Our property is to the right of the their driveway. Thank goodness all of our houses are situated up from this area. And, the good news is we didn’t have any leaks in the house from the 7-9 inches of rain we got between Thursday and Friday. 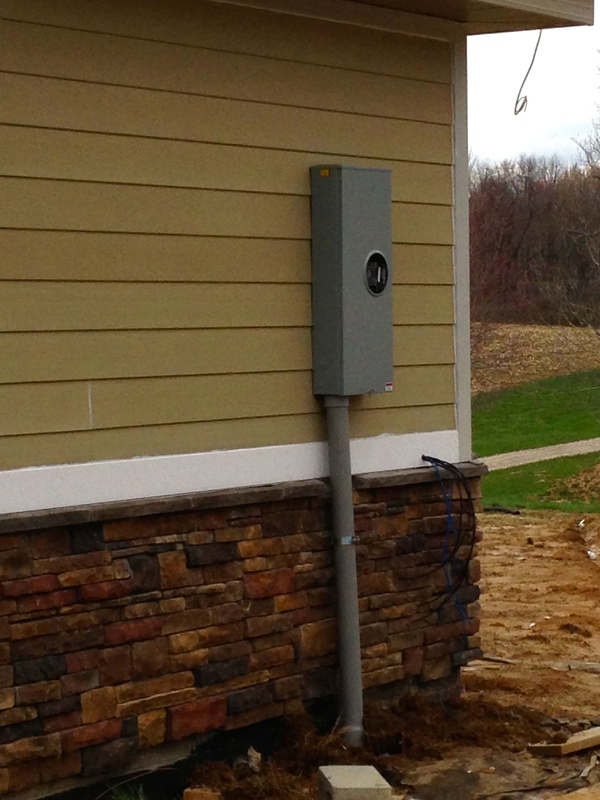 Big ‘ol electric meter installed! Here are the inside electric panels in the laundry room. There are two outlets coming out from them I guess we will eventually be able to use when the power is turned on. We have a cabinet that will set below these panels. We were going to put a TV on that cabinet as my computer area is right across from it. We’re hoping the TV will hide those ugly panels. I went into the garage and found my note had fallen behind one of the cabinets. I guess Bill will have to call the electrician to find out what’s up. And no surprise, the painters never showed up. 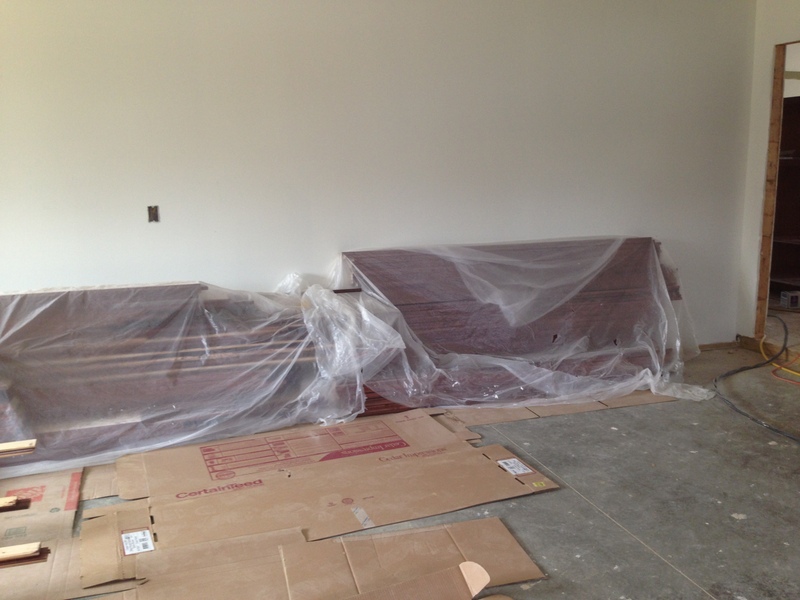 •Mark and Shayna need to finish the cabinets and paint the family room before we can bring in the trim carpenter. 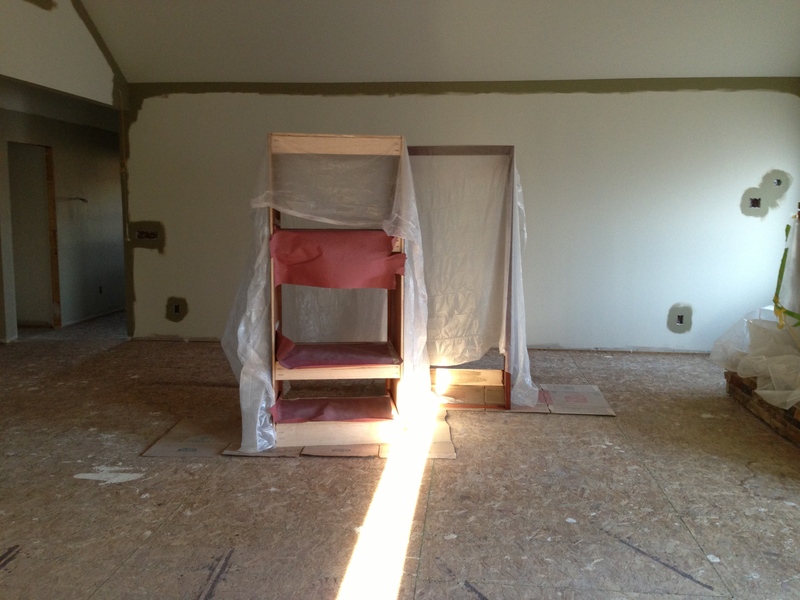 I figure the painters have two weeks of work left – if they show up most week days. After that, they can move to the exterior of the house and start painting. •Jim said Allen is supposed to be here this week to install our septic. 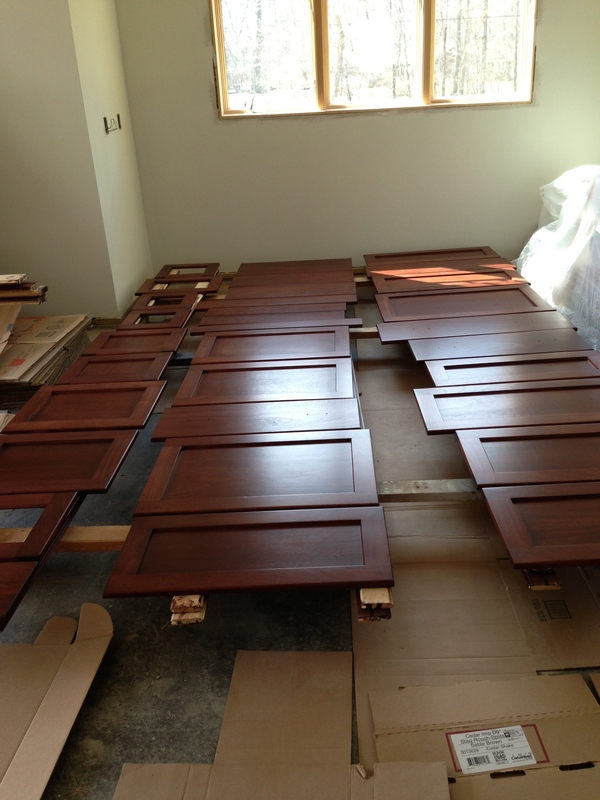 •Our bathroom vanities, bathroom storage cabinets, and window seats are being delivered Monday, April 7. 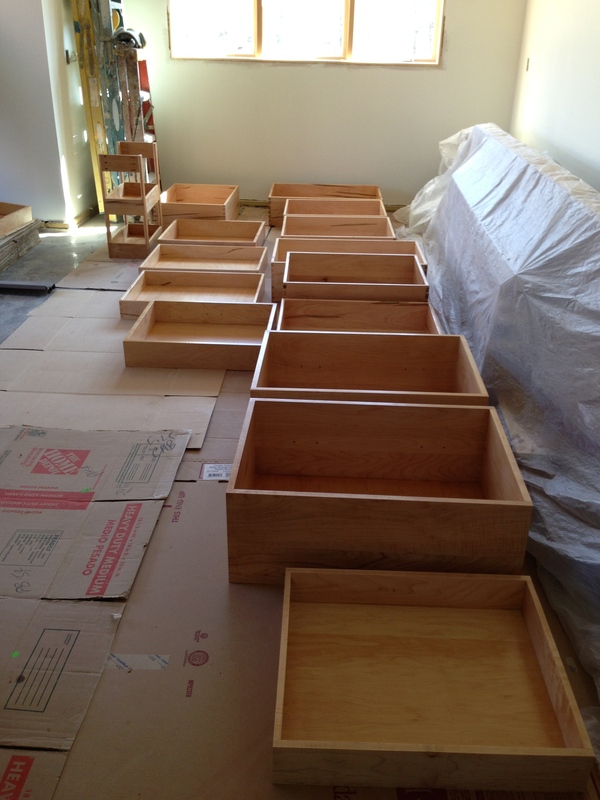 •After the cabinets are painted and stained, Bill will install all the slides and the Rev-A-Shelf items. •After exterior of house is painted, the gutters will be installed. 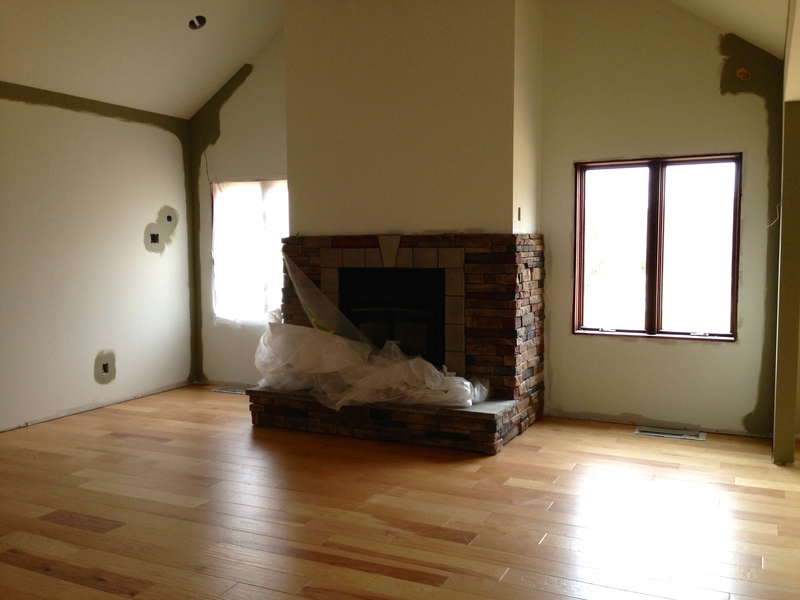 •Once the trim carpenter installs all the cabinets, vanities, window seats, interior doors, baseboards, and all the interior trim and beams, we can bring in granite people. •I guess Bill will install all the door handles – another PITA job. •After granite (which includes our sinks and bathroom vanities) is installed, plumber can come and hook everything up and install stuff. Lots of plumbing to be installed in the pole barn, too! •Electrician and gas will be hooked up. Run electric to pole barn. •HVAC and digging for geothermal will be installed. 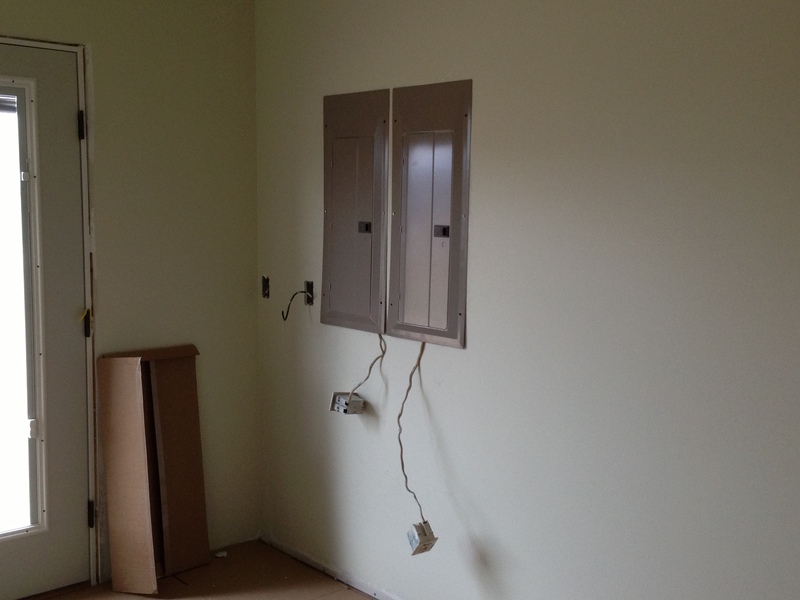 •Electrican will install all our light fixtures and fans (not sure when that happens). •Concrete for back patio and driveway laid (not sure when that happens). •Glass shower door is installed. •We’ll work on closet systems. 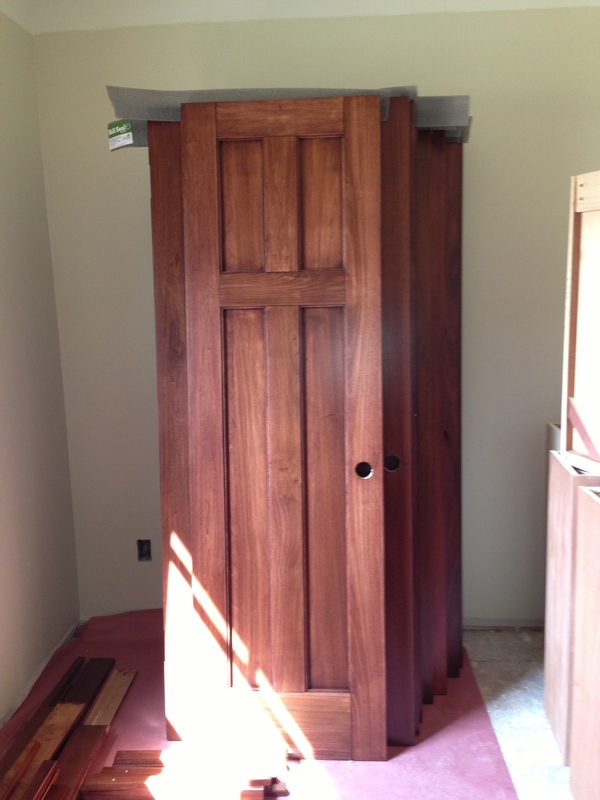 •Painters come back and put another coat of paint on everything inside and do any staining touch-ups. •Final clean (top to bottom). Whew! There is still a lot to happen before moving in. We hope to be in sometime in May. Time will tell. 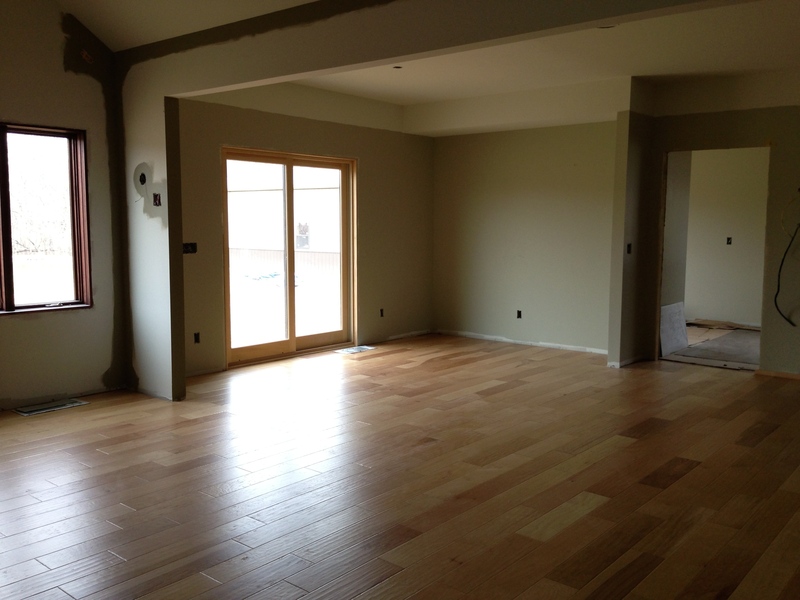 This entry was posted in Building a custom home, Custom cabinets, Electric/Gas, Hardwood Floors, Painter, Siding. Bookmark the permalink. 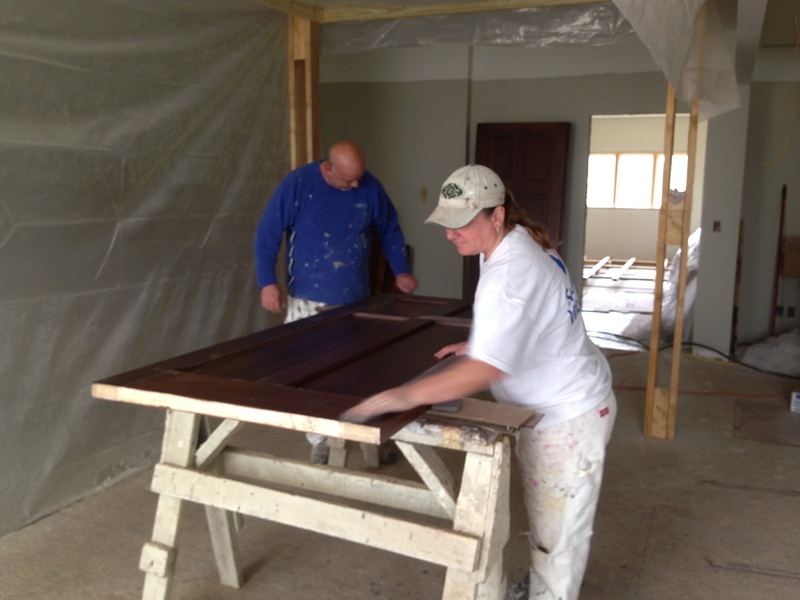 ← Stain and Poly and Cabinets, Oh My! Robyn, I’ll try! Super busy weekend. Soon. I promise! It Started with A Dream. It’s Looking like a Home! There’s Always Something New for Bill to Do! Troubles Turned to Blessings in Disguise!